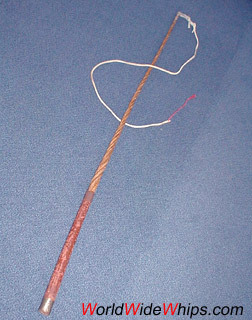 Made from four splits of cane, which were put together and twisted using hot steam. The handle area remained untwisted, the gaps betwen the four splits were filled with cane to give a round appearance. Then a coating with fabric and several layers of lacquer followed. At last, nickel-plated mounts were applied. Whips of this kind were a mass product in the pre-war time.